According to Karl Popper, scientists can only approach the truth as they attempt to falsify their theories. Popper claimed that positive confirmations of a theory are suspect since they are not falsifiable. In Poppers system, as more theories fail, perhaps those that survive become less bad. Children do not learn Popper’s version of science. Instead they learn that repeated, empirical measuring, mathematics and logic are the supreme authority over truth. Children also do not study the history of science as described by Thomas Kuhn. Kuhn claimed scientists are highly trained practitioners of a “normal science paradigm.” Their paradigm informs scientists what is a problem, how to define evidence, how to gather evidence and how to solve problems using the assumptions and techniques supplied by their paradigm. Scientists are unable to consider novel ideas that conflict with their paradigm. Occasionally an outsider questions the fundamentalist paradigm. When this happens, younger scientists may switch to the new paradigm as the older ones die off clinging to the old system. The new version of science advances until the next scientific revolution upsets the system again. Both Popper and Kuhn theories of science have historical support. History shows that scientists regularly shore up their theories with auxiliary hypotheses buttressed by unfalsifiable ideas to explain away contradictions. The clay tablets from the astronomical priests of Bel Marduk record their complex, mathematical procedures for calculating the ephemeris of a plant god. One tablet from Babylon records the fundamentalist dogma that was the basis for their mathematical science. “The signs on earth just as those in heaven give us signals. Sky and earth both produce portents; though appearing separately, they are not separate. Sky and earth are related.” When the omens failed, they just claimed the planet gods were placated by the sacrifices they recommended to the king. Scientists are much like the mathematical priests of Marduk. They occasionally even wear tasseled hats and long robes to show that they have mastered the fundamentals of their faith. Yet their faith is never explicitly discussed or questioned. They learn it implicitly, by measuring and practicing textbook, mathematical problems. Yet the faith of scientists is historical and is even predicted in the Bible. In the last days, Peter warned, mockers will come claiming that all things remain the same. We can trace through history how the fundamental faith of all scientists came into existence. Their core faith is that the properties of matter are fixed, not emerging relationally. If you are unaware of how physics got its first principle, read about it on this web site. Let’s examine how empiricism works. 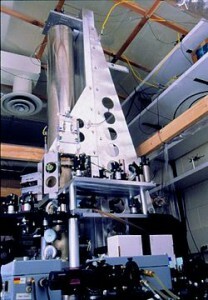 By international agreements, the primary standard in science is the cesium atomic clock. By definition 9,192,631,770 microwave pulses from cesium 133 is a second. The cesium clock is really two clocks. The input clock sweeps through various frequencies as it radiates the cesium with microwaves. Eventually, it will hit the cesium with the particular frequency that energizes it. When this happens, the cesium relaxes and emits microwaves, These are counted by the output clock to define the duration of a second. The output clock also tunes the input clock for maximum emissions by means of a feedback loop. If cesium is changing itself relationally, atomic clocks would actively tune themselves to the continually changing atoms. The cesium second is operational defined based on the assumption that atoms are perpetual motion engines. Meters, velocities, laws of physics, most empirical measuring units and mathematical constants depends on the assumption that atoms dither with perpetual motion. Yet we can see the past and no ancient atomic clock pulses with the rates of modern atoms. The earliest atomic clocks (that shine from ancient galaxies) tick at less than 10% of the frequencies of modern atoms. 40 years ago, NASA sent two spin stabilized spaceships out of the solar system in opposite directions. NASA beamed radio signals, derived from hydrogen maser atomic clocks, to the distant Pioneers. The spacecraft amplified the received clock signals, multiplied them by a ratio and transmitted them back to Earth. (The spacecraft changed the received signal by a ratio so that they could transmit and receive simultaneously using the same antenna). When NASA’s atomic clocks-of-the-moment were compared to their rates from hours ago, the two signals did not match. Instead, the anomalous differences increased with increasing distance. The Pioneer Anomaly correlates with the Hubble ratio times light-speed. Astronomers use the Hubble ratio to estimate the distance to ancient galaxies using the differences in their observed colors (light clock rates) and the rates of local, modern atoms. Evidently NASA’s atomic clocks were accelerating at approximately the same rate as the atomic clocks in billions of distant galaxies. This is when scientists contrive auxiliary hypotheses that are not falsifiable to buttress their faith in atomic perpetual motion. They have invented a universe that has four times as much invisible matter as the natural, visible kind. Why? None of their laws work in galaxies. To preserve their theories, they imagine that vacuum forces push galaxies away while changing the frequencies of all light passing through the void. They even imagine that more than 70% of all active processes in the universe involve accelerating the stretching of the vacuum of space time. Their greatest myth is that a tiny of vacuum exploded and created everything out of nothing. Scientific cosmologies are the greatest system of mythology in history. All the myths were contrived to protect an assumption they never discuss or examine, the medieval assumption that the essence of substance is changeless. Scientists cannot question their fundamentalist creed because their structured empiricism and mathematical laws were built on the sands of an untested idea, that the properties of matter are fixed, not emerging relationally. The visible history of how galaxies grew from tiny naked globs to huge, local, dusty growth spirals is the most powerful evidence against the first principle of science. Galaxies started out as naked cores of unformed matter. The stars emerged and spread out as the visible properties of matter kept on changing relationally. What we see in cosmic history fits the literal text of the creation account. He continues to form the Sun, Moon and stars and continues to make them into things that spread (Hebrew raqiya). It also supports the biblical principle that the creation is enslaved to change that is orderly and acts together (Romans 8:19 – 22). I predict that western scientists will never abandon their doctrine that the properties of matter are fixed, not emerging relationally. Ordinary people, not so thoroughly trained in the scientific dogma, will lift up their eyes and look at galactic history. They will abandon the unfalsifiable scientific myths and simply believe their eyes. What glory the Creator will get when He proves that man cannot come to know Him through philosophy, only by the faith of a sinner who trust Him alone for salvation. The demise of western science will be one of His greatest victories. His glory is visible in the heavens. Look! The picture of NIST-F1 is courtesy the National Institute of Standards and Technology (NIST). 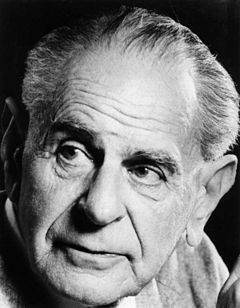 The picture of Karl Popper is in the public domain, from Wikipedia.